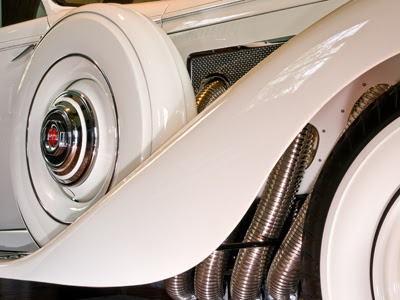 The image you see above is a close-up shot of a 1935 Duesenberg Automobile. This particular car is one of many fine vehicles in the collection of the Gilmore Car Museum. The museum is spread out over 90 acres and has over 200 classic cars. It is located near Kalamazoo, Michigan and is well worth the trip if you enjoy automobiles and are in the area. The image itself was taken mid morning. The car is located in a barn which has several windows which provide reasonable lighting but not really enough for a hand held low ISO shot. Fortunately the museum is very accommodating of photographers and I was able to use my tripod. 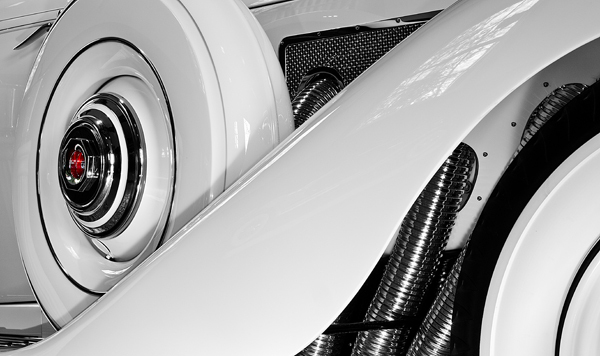 One of the features of the automobile that I wanted to capture was the way the chrome exhaust tubes come out of the engine and go through the fender itself. In the lighting that I had, the area under the car was dark so I experimented with an off-camera flash in an attempt to brighten the underside without making the entire car too bright. I used a manual exposure on the flash and cut the power down to about 1/32 or 1/64 power. The finished shot required minimal processing. The image below is the raw image as it came out of the camera. As you can see, the car was white, although in the barn lighting the car took on a bit of a yellow-ish look. I wanted to keep the feeling of the white car and I wanted to emphasize the details rather than color. I converted the image to black & white, but I kept the bit of red on the spare tire holder. About the only other change to the image was a crop to remove some extra information at the top and bottom of the image, neither strip contributed much to the image. I wanted the focus to be on the details and the chrome exhaust. As always, I'm interesting in hearing constructive feedback. Thanks!